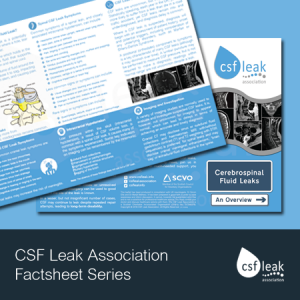 We are delighted to announce the publication of Cerebrospinal Fluid Leaks: An Overview, the latest edition to our popular factsheet series. It is free to download from our website. This new leaflet provides a valuable overview of cerebrospinal fluid (CSF) leaks, both cranial and spinal, and touches upon key signs and symptoms, diagnostic techniques and treatment options. It has been produced in consultation with two UK neurologists working in the NHS: Dr Simon Ellis, a consultant neurologist at Royal Stoke University Hospital, and Dr Manjit Matharu, a consultant neurologist at the National Hospital for Neurology and Neurosurgery. Cerebrospinal Fluid Leaks: An Overview is a must-read for both diagnosed sufferers and those who suspect that they may be suffering from a CSF leak. It is ideal for inclusion in leaflet displays or handing out as part of an awareness-raising event. The leaflet also provides useful information for GPs, doctors working in emergency medicine, paramedics and other healthcare professionals who may not routinely encounter CSF leaks in their work, but nonetheless need to know what to look out for and how to treat them. The time has flown by and the Kilt Ride 2016 – the world’s first ever large-scale awareness and fundraising event for cerebrospinal fluid (CSF) leaks – is almost upon us. This fantastic two-day event, organised by Ray Michael for Saturday 28th and Sunday 29th May 2016, will see up to 100 tartan-clad bikers travel around Scotland, from the Borders to the Highlands, in support of CSF leaks. The convoy will depart the Leadburn Inn, Midlothian, at 09:00 to the sound of bagpipes and the taste of bacon butties, making its way to the second rendezvous point at Tesco Extra Perth, Edinburgh Road for 11:30. Thereafter, it will make its way through Fife, Perthshire through the Spittal of Glensheeand and into the Cairngorms. The overnight stop will be at Dores, on the banks of Loch Ness, before travelling back south the following day, via Glen Coe and Bannockburn. We are sure that the event will be a roaring success and would like to thank Ray for his dedication and support, and for all of the hard work that he has put in over the past 6 months to make it a reality. We would also like to thank The Dores Inn, the Leadburn Inn, Saltire Motorcycles and Alba Customs for supporting the event. Event t-shirts and raffle tickets (with some fantastic biker-related prizes) will be available to buy at the Dores Inn on the Saturday evening. If you would like to view more information on the event itself, please visit the dedicated Facebook page. If you would like to support the event with a donation, you can do so via the event page, by visiting our donations portal on TotalGiving or, if you have a UK mobile phone, by texting: LEAK00 £5 to 70070. BACKGROUND AND PURPOSE: Spinal meningeal diverticula have been implicated in the pathogenesis of spontaneous intracranial hypotension and have been proposed as both diagnostic features of and therapeutic targets for the condition. We compared the prevalence and myelographic appearance of spinal diverticula in patients with SIH and healthy controls. MATERIALS AND METHODS: Patients satisfying the ICHD-2 criteria for SIH were retrospectively identified. CT myelograms of 19 patients with SIH were compared with CT myelograms of 18 control patients. Images were reviewed by 2 blinded neuroradiologists. The prevalence, morphology (round versus multilobulated), size, and location (cervical, upper thoracic, lower thoracic, or lumbar) of spinal meningeal diverticula were analyzed. RESULTS: There was no difference in the proportion of patients with diverticula in the SIH group compared with the control group (68% versus 44%, P = .14) or in the mean number of diverticula per patient (6.3 versus 2.2, P = .099). No difference was seen in the morphology (P = .95) or size (P = .71) of diverticula between groups. There was a difference between groups that just reached statistical significance (P = .050) in the location of the diverticula along the spinal axis, but substantial overlap was seen between groups for all spinal locations. CONCLUSIONS: Despite the well-established association between spinal meningeal diverticula and SIH, we found no difference in the prevalence or myelographic appearance of diverticula in patients with SIH compared with controls. Further investigation into the role of diverticula in the diagnosis and treatment of SIH is necessary. ABSTRACT: Radionuclide Cisternography (RNC) is of potential value in pointing out the sites of cerebrospinal fluid (CSF) leakage in patients with spontaneous intracranial hypotension (SIH). In the current report, we present two patients who underwent RNC for suspected CSF leakage. Both patients underwent magnetic resonance imaging (MRI) and RNC for evaluation. We describe a simple method to increase the detection ability of RNC for CSF leakage in patients with SIH.